13 Questions is a weekly series where we ask chefs 13 questions to get to know them outside of the kitchen. 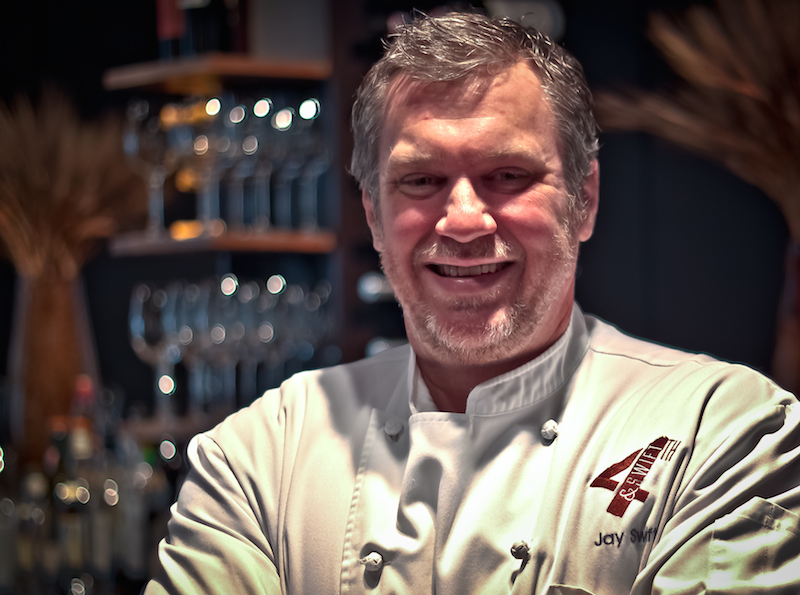 Jay Swift is the chef and owner of Noble Fin, formerly of 4th & Swift. What’s been the biggest difference cooking OTP vs. ITP? It’s not that different, but there’s definitely a different demographic. It’s an older crowd, but they’re very loyal. But I lived in New York City, D.C., and Boston, and nowhere else does this thing exist with people outside the perimeter. Atlanta is just really insecure and needs to feel superior to someone, but in New York no one gets superior about Bridge and Tunnelers. Great food is great food. What’s one thing you wish you knew how to cook? Thai food or Sichuan food because I love them both so much. I’ve dabbled with some Thai food, like pad thai, but learning all the techniques and ingredients and best processes is a challenge. I am cyclist. I love to do mountain biking. I live in Cobb County, so there’s Blankets Creek or Rope Mill Park. If I have a whole day, I go up to Ellijay. My go-to meal for most of my life was peanut butter and jelly with Welch’s grape jelly, Jiff peanut butter, and Wonder Bread, and a side of Utz potato chips with a glass of milk. Sometimes it was peanut butter and jelly with Fritos on the sandwich. What was the last TV show you bingewatched? Bloodline, I liked it so much I watched both seasons twice. You attended a culinary school apprentice program. Do you recommend culinary school? I recommend going to 10 to 15 of the best restaurants in the city and knocking on the door to work there. No one will tell you they learned more at culinary school than working at restaurants. If they do, they’re lying. I enjoy the creative aspects of marketing, from writing copy to photography to graphic art. I do all my own food shots for our website. I hate to admit it, but I am monstrously impatient. I don’t like waiting in line, waiting for food. I work on it, especially with my staff. I’ve really switched over to wine in the past five years. I love alternative wines, Alsacian varietals, Grüner Veltliner, Pinot blanc. With red wine, I love Pinot noir, and, of course, cab. I was a freshman in high school. Hasslinger’s Seafood in Baltimore—it’s a combination seafood takeout/liquor store. I worked in the kitchen, and we made crab cakes, fried shrimp, steamed crabs. It’s where I learned how to make crab cakes, potato salad, and coleslaw, and I still use that crab cake recipe. What do you miss the most about Baltimore? Being that close to the ocean and the bay, the fishing and beaches. The Book of Aron by Jim Shepherd. It was really well-written and heartbreaking. I don’t like the flavor of sushi nori unless it’s in a roll. But there’s something too much if it’s in a sauce or a ground up.